The soul of a great trip lies in the culture, cuisine, landscape and people of a country. Add to this a unique experience of a musical amalgamation of international and local musicians, and you end up getting a trip that is bound to leave a permanent and exquisite mark of its own. Come October 2011, and the scenic land of Nepal, tucked away in the Himalayan foothills, is all set to come alive to the soulful sound of jazz and the melodic sound of Nepal’s traditional music. 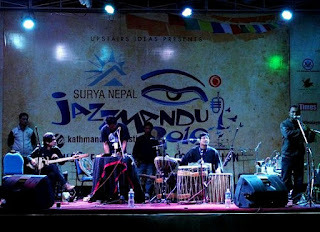 Celebrating its 9th anniversary, Jazzmandu or the Kathmandu Jazz Festival is an international music event annually held in the fascinating land of Nepal. It kick-started in 2002 and is organized by Upstairs Ideas Pvt. Ltd. The concept was built and developed upon by Chhedup Bomzan of The Jazz Upstairs Bar, and Navin Chettri, drummer and vocalist of “Cadenza” (the local jazz outfit). Jazzmandu has been a platform for many a virtuoso performer from across the globe, like Trilok Gurtu and headliners like Louis Banks, Natalie Williams, Jesse Van Ruller, The Latin Jazz All Stars, Mark Brown Band, and Catia Werneck Quartet to name a few. Sharing stage along with these names are the traditional musicians of Nepal, and the magical feel that accompanies such a performance is an experience not worth missing. Continuing its heritage, this year too, Jazzmandu has an array of awesome talents from various cultural backgrounds and from various countries giving their refreshing and own unique touch to jazz. Reflecting today's vibrant and cross cultural musical landscape, Jazzmandu is a unique chance to explore the diversity of Nepal’s social and cultural landscape in all its grandeur, the hospitality and warmth of its people, the breath taking landscape of the mighty Himalayas and to also have a world class musical experience. A cross cultural exchange of musical vibes and knowledge provides a rare chance to explore a whole new side of one’s globetrotting. Since its inception, Jazzmandu has come a long way in developing its core ideas and has continued to strive towards excellence. This festival contributes to the exposure of Nepal to the rest of the world and to the enrichment of its children’s musical growth by organizing free educational music programs, workshops and clinics for school students around Kathmandu every year. It has also contributed towards bridging all gaps and heralding peace through the medium of music...music, which knows no boundaries. Today Jazzmandu in all its glory is one of the most renowned music festivals and is something that should definitely be included in everyone’s “Nepal experience”.